CMJ Music Marathon 2013 yet again saw a convergence of hundreds of bands and thousands of fans on the clubs of the Lower East Side, East Village, and Williamsburg in New York City. Coincidentally, many of the bands we were most looking forward to were female-fronted (Speedy Ortiz, Eternal Summers, Hunters), and they did not disappoint. While times have certainly progressed, female-fronted bands still have something to prove, and it was good to see several super-talented guitar players and songwriters, as well as singers and performers, show themselves to be just as good as their male counterparts. 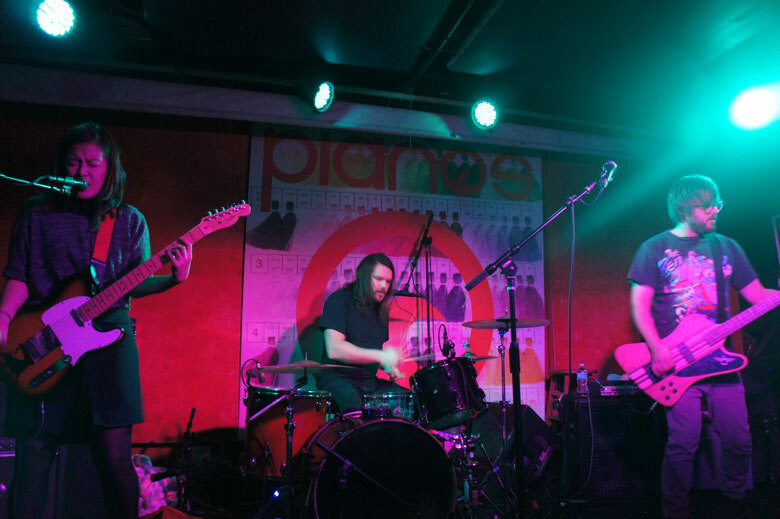 All-dude groups Caveman and Grandchildren both had solid performances that left me with a good “I-discovered-something-cool-at-CMJ” feeling as well, and electropop groups were well-represented as always, with NONONO and Porcelain Raft leading the pack. Brooklyn-based Caveman clearly felt right at home at Rockwood Music Hall, and the crowd was full of devoted fans. Lead guitarist and singer Matthew Iwanusa draws comparisons to Shins’ vocalist James Mercer, and the band does indeed seem to draw inspiration from them, as well as African music and experimental post-rock, utilizing harmonies, tribal drums, keyboards, and hazy guitars. I enjoyed the dreamy but catchy songs off their 2013 self-titled release, like “Shut You Down” and “Where’s the Time”, as well as old favorite “A Country’s King of Dreams” from their first release, Coco Beware. This was one of those CMJ experiences that is the reason you go to CMJ: to discover an amazing band you’ve never heard of. When I made my way downstairs at Cake Shop, I wasn’t sure who was playing, but they immediately caught my attention. An ensemble of six dudes playing nearly every instrument imaginable, their melodic pop with hits of electronic and psychedelic accents make this Philadelphia-based group an interesting listen. They played several songs off their newest release, Golden Age, including “Sunrise”, “End Times”, and “No Way Out”. Listening to Porcelain Raft’s latest effort, Permanent Signal, I expected some low-key, shoegaze-y electro songs from Italian-born Mauro Remiddi, who is now based in New York. Unsurprisingly, he opened for M83 on their European tour in 2012. Playing tonight with a partner, the mood was actually pretty joyful and the songs rather upbeat. Switching positions to various synthesizers and keyboards proved challenging on the tiny stage, but the two managed it several times. Remiddi has a long history playing and singing with various bands, and his worldliness comes through in his thoughtful compositions. Speedy Ortiz was probably the act I was most looking forward to, and I eagerly shoved my way to the front of the crowded 285 Kent to see them. The Northampton, MA-based foursome, while admittedly drunk, still managed to tear through favorites like the crowd-requested “Cash Cab,” as well as “Tiger Tank” and “Fun”. They even played the somewhat depressing “No Below,” another request from the audience. Lead singer Sadie Dupuis’ signature off-beat (literally) and creative lyrics were complemented by her impeccable guitar playing, reminding me of early Liz Phair, which is, for me, a very good thing. The end of the set saw the front section turned into a mosh pit, from which I quickly exited, but still, always good to see (from afar). I’d only heard of NONONO the day before, so when lead singer Stina Wäpling mentioned the trio was from Sweden, I thought, “Of course they are.” NONONO plays electropop in the vein of Little Boots and Icona Pop, utilizing Wäpling’s crystalline voice to sing catchy, life-affirming tunes like “Pumpin’ Blood”, which is sure to be on a commercial soon, if it isn’t already. At Mercury, the group played that song, as well as others off their new EP of the same name. This Virginia-based trio focuses on the guitar and vocal skills of Nicole Yun, and thankfully her skills are top-notch. For a 6:30 p.m. show, the place was packed — and although Yun claimed to be losing her voice, we couldn’t tell. Songs like “You Kill” and “Heaven and Hell” off their 2012 album, Correct Behavior, sounded tight and displayed Yun’s range. While they came off as a bit too serious, their music is fun and catchy, and even though the set was short, I got enough of a taste to leave me wanting more. 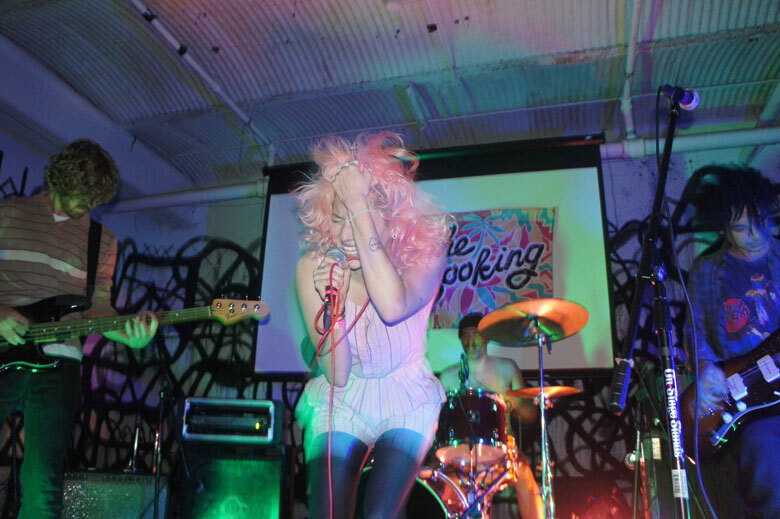 While their music may not be the most original, band leaders and Brooklynites Izzy Almeida and Dereka Watson certainly know how to put on a performance, what with Almeida swooping her pink hair and climbing the speakers and Watson growling into the mic. Their punk-grunge influences come through loud and clear on their latest release, produced by none other than James Iha. At 285 Kent, the band had the audience enthralled as they ripped through songs like “Narcissist” and “It’s True”.